YOSHIKAWA, Japan — It's drawing time at this suburban nursery school in Japan, but instead of crayons, tiny fingers are tapping on colors on iPad screens and taking selfies. Digital schooling has arrived in this nation long known for its zealous commitment to "three R's" education. That's only about 1 percent of this nation's kindergartens and nursery schools. But it's a start. Coby is helping lead a national initiative in "digital play." "There is no right or wrong answer," said Akihito Minabe, the preschool principal leading the session. "They think on their own, they learn it's OK to think freely, and it's fun to come up with ideas," said Minabe. In the U.S., 98 percent of children age 8 and under have a mobile device in their homes, while 43 percent have their own tablet, according to The Genius of Play, a U.S. program that researches education and play. That's similar to Japan, where each adult has an average of more than one smartphone and about half of preschoolers have access to a mobile device, according to Japanese government data. In many U.S., Asian and European preschools and elementary schools, teachers use technology to present stories, music and other information. Educators are also studying children's social development through how they learn to share digital devices. Much of what's driving the adoption of tablets in U.S. preschools is a belief, founded or not, that an early start will make kids smarter at technology, said Patricia Cantor, a professor of early childhood education at Plymouth State University in New Hampshire. "Touchscreen stuff is pretty intuitive. They don't need training," Cantor said. 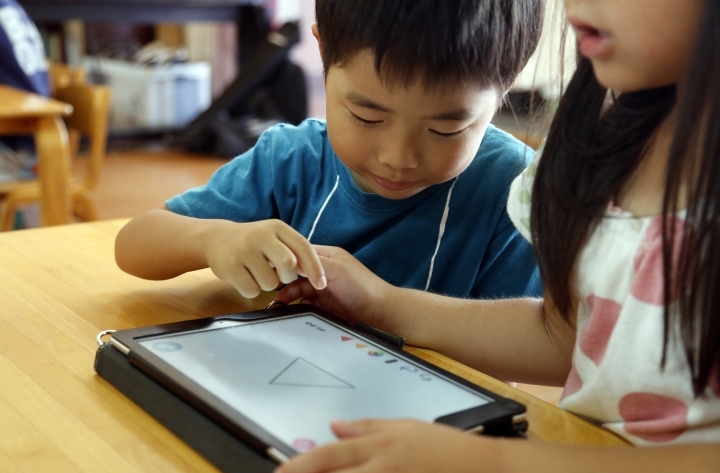 Some studies show positive outcomes among young children using mobile devices to improve their literacy, science or math skills, but there's little research comparing tablet-assisted learning to more conventional teaching approaches, according to a review of 19 studies by Christothea Herodotou, a lecturer at The Open University in the United Kingdom. Herodotou said it's unclear which features might help or hinder learning. Devices and apps can also be misused — for instance, to keep children occupied so teachers can do other things. "Even if it's designed to encourage learning or exploration or curiosity, it may not be used in that way," said Cantor. "There's so much junk out there." Still, the target age for "digital play" is getting ever younger. Experts have known for years that playing is how children learn, says Ken Seiter, Executive Vice President at The Toy Association, a nonprofit, which represents businesses that design, produce, license and deliver youth-entertainment products. Japan's classrooms tend to be more structured than in the West, with students often acting in unison as they line up, bow and chant together. Children tend to be passive, and the emphasis is on the group rather than individuals. Youngsters, even some preschoolers, attend extracurricular cram schools. KitS' designers have sought to make activities fun. One aim appears to be nurturing outspokenness. By the time today's 5-year-olds start work, most jobs will require computer skills. Given Japan's shrinking population, people may work into their 80s, shifting jobs several times. Digital skills are more critical than ever, he said. 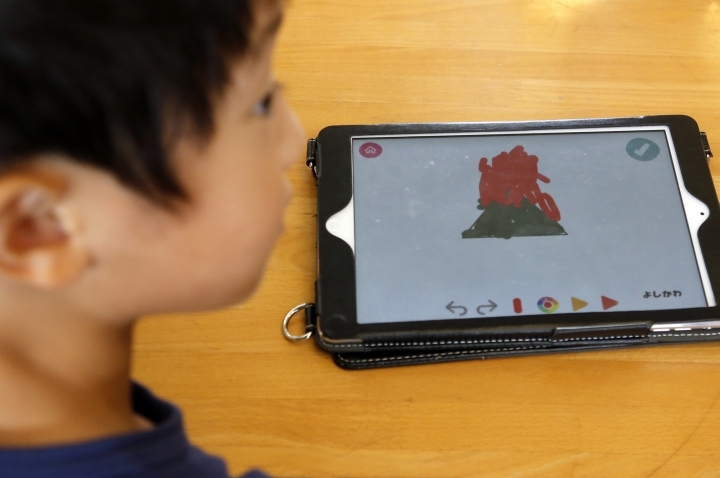 Digital tools deliver the equivalents of libraries and museums at a child's fingertips, said Ron Shumsky, a child psychologist who works in Japan. That can be addictive, he cautions, and students must be taught safe and responsible "Digital citizenship," he said. It's so compelling it pulls you in," he said. "It keeps you wanting more." Experts warn that staring for too long at screens can damage eyesight and deter creative thinking. It's a complex problem, since children may see their parents immersed in devices themselves. 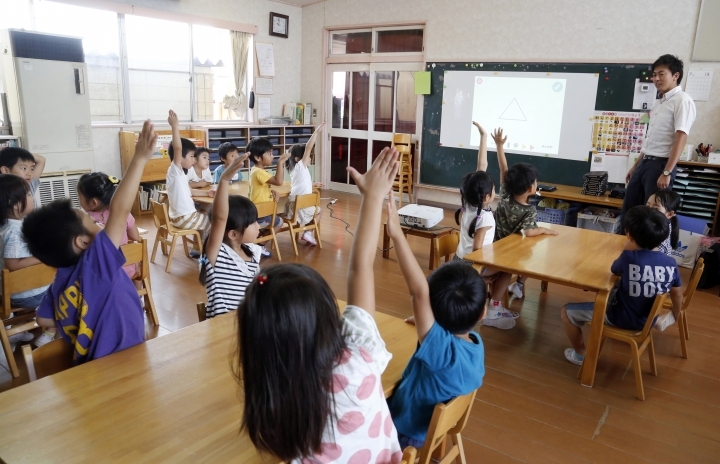 Japanese preschools like Coby are subsidized by local governments. Fees, including meals, are on a sliding scale based on income with the poorest families paying nothing. Each preschool pays SmartEducation an initial 500,000 yen ($4,400), not including the cost of the iPads, and 30,000 yen ($265) more a month for maintenance. The cost for training teachers is included. "I realized I tend not to wait for what the children have to say," said hospital worker Masami Uno, whose son, 5-year-old Ayumu, and 2-year-old daughter attend Coby. "It made me stop and think about that." "It's fun," said Yume Miyasaka, 6. She noted with a little pride that her father uses an iPad for work. But, referring to her iPad creation, she said, "He usually doesn't draw shaved ice." AP Business Writer Matt O'Brien in Boston contributed to this report.